Joanne Cuffe, Kemi Craig, David Ferguson, and Judith Price. The Choreography Walk is devised by Justine A. Chambers. The four selected Victoria choreographers will work with Justine A. Chambers and Susan Elliott in the development of a new Choreography Walk to be presented during Dance Days 2019. The walk will start at the Atrium and finish at the McPherson Playhouse, lasting about an hour. Walks will occur at 10AM Saturday January 26 and 2PM Sunday January 27. RSVP to rsvp@dancevictoria.com with “Walk” in the subject line. The Walk focuses the participant’s attention to the ways in which their specific environment moves their body in relation to architecture, urban planning, and natural topography. The Walk will consider the social choreographies found in the everyday, and offer a gentle intervention on these daily movements. 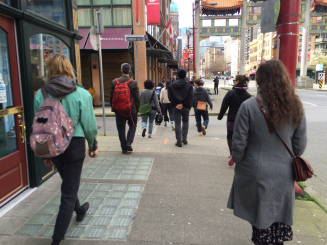 The pedestrian, the seemingly banal, and the patterns and constellations of quotidian life are offered up to walk participants and passers-by as a way to reconsider how they move in, and are moved by, the world around them. Participants on the walk will not stop to watch the choreographies. Instead each work will be made to be seen on approach and in passing. The choreographies are fleeting works that respond to: ‘choreography as a way of seeing the world” or “choreography as a way of being in the world”.